Time and budget pressures are a reality for thousands of households. When it comes to meals and food choices, families with growing children and working parents can often find it difficult to find a healthy lifestyle balance. It’s often easier to grab fast-food or ready-made meals which may be a huge time-saver but that are not doing your health or budget any favours. For those who want to eat healthily, wholesome food options don’t necessarily mean spending a fortune. Simply understanding which foods to choose to be your family’s best shot at getting good all-round nutrition is the first step in the right direction. Breakfasts for Better Days™ dietitian, Cheryl Meyer, says it’s not just about making time for meals, it’s about the foods you choose. “Over and above simply consuming food, the nature of your choices is key. By providing your family with meals that contain high fibre carbohydrates, lean protein, vegetables, fruits and healthy fats you can help them to maintain sustained energy levels needed to make the most of your day,” says Meyer. Here are her top five tips to keep the whole family and your bank account healthy. Planning ahead of time means you are less likely to overspend on snacks and on-to-go options or overeat as a family. It also means that you can plan healthy options for everyone, using ingredients that are accounted for across the week. A well-thought plan means you can make sure your child is getting all the nutrients they need through a variety of vegetables, fruits, proteins, starch and healthy fats. A big plus about planning ahead is cost-effectiveness – thorough planning of meals and snacks means you can stick to a shopping list and because all items will be used during the course of the week, it reduces wastage. Making time for breakfast should be a priority. Having a balanced breakfast like a bowl of cereal and milk can ensure you are getting many of the vital vitamins your family needs including iron, vitamin A and protein. A full tummy before school or work also means you will be able to concentrate better and make the most of your day. Aim to include plenty of vegetables and fruit during the day. These can accompany your morning cereal, provide a snack throughout the day and give the perfect added extra to evening meals. Incorporate fruit and vegetables in your diet that cover a spectrum of different colours. This will add visual-appeal to your plate while increasing the number and variety of vitamins, minerals and protective compounds that you consume. Try and limit your intake of artificial sugars or added sugar to meals. If you are looking for a little extra flavour, use natural herbs and spices during food preparation rather than added salt and sugar. This also means trying to avoid sugar in tea and coffee. Gradually reduce the amount you add until you can leave it out altogether - this means you have time to adjust and soon won't miss it at all. Proteins are vital for muscle repair and growth. If your budget is a little tight, serve meat less often opting instead for beans and other legumes, fish or chicken. Legumes like split peas, lentils and dry beans are also a great way to make a meat dish go meal a further, by bulking up your meal and increase your fibre intake. 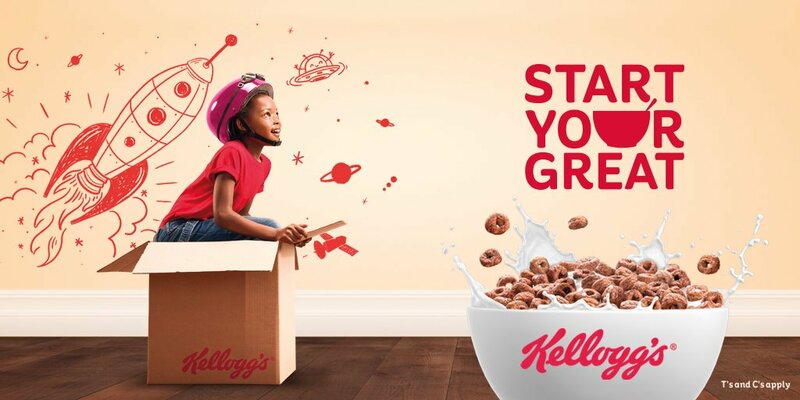 Through Breakfasts for Better Days initiative, Kelloggs have provided over 13 million servings of cereal to South African school children since 2014. To learn more about Kellogg, visit the website: www.kellogg.com, Facebook: www.facebook.com/KelloggsSA or follow on Twitter @KelloggsZA.